Quick bites like these are a delicious way to greet guests. Serve as a warm appetizers or hors d’oeuvre with a side of creamy tarragon dipping sauce. Pat chicken pieces dry. Heat oil in a heavy pot or cast iron skillet until heated to 350°F (175°C). In a medium bowl, combine the breadcrumbs, parmesan, poultry seasoning, garlic powder, dried thyme and ½ teaspoon (0.5 mL) salt and pepper. In another bowl, add buttermilk. Dip chicken cubes in buttermilk then evenly coat in breadcrumb mixture. Knock off excess and set aside. Fry chicken in batches, 9-11 minutes until cooked through. Drain on paper towel and season with salt. While chicken is frying make dipping sauce. Combine sour cream, mustard, tarragon, Tabasco and season with salt and pepper. 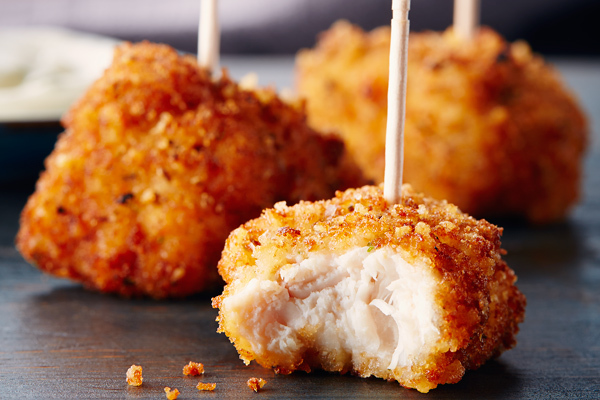 Arrange chicken bites on a plate with a bowl of the dipping sauce.